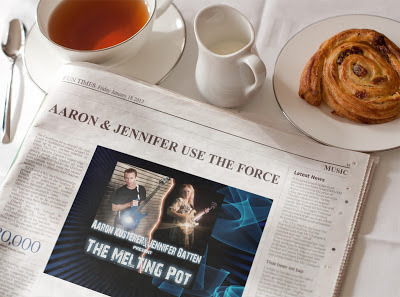 Aaron & Jennifer are a Blaze! Honolulu, HI January 16, 2013 - Buddy Blaze artist, Aaron Kusterer, has teamed up with former Michael Jackson guitarist, Jennifer Batten to release a new instrumental rock single entitled, The Melting Pot. "This single has been a blast to put together with Jennifer", says Kusterer. "She is a wonderful person and player; it doesn't get any better than that sort of a combination." Prior to The Melting Pot, Kusterer has released several albums and has been featured in Guitar Player Magazine (Dec. '11). In addition to this project, he has just finished producing a new collaborative effort for Buddy Blaze Fine Electric Instruments which is due out on January 20. 'The Melting Pot' will be released Tuesday, January 22, on Steve Vai's Digital Nations (www.digital-nations.com). To get a sneak preview, head over to www.aaronkusterer.com!